A 'LowVoltage' event occurs on HMI when battery voltage hits below a certain predefined threshold set by the system. In case of such event, SDL operations are halted including receiving and processing of normal RPC messages from HMI. HMI sends system signals of the range SIGRTMIN - SIGRTMAX for LowVoltage, WakeUp and IgnitionOff to all smartDeviceLinkCore processes. SDL ignores all the requests from mobile applications without providing any kind of response. 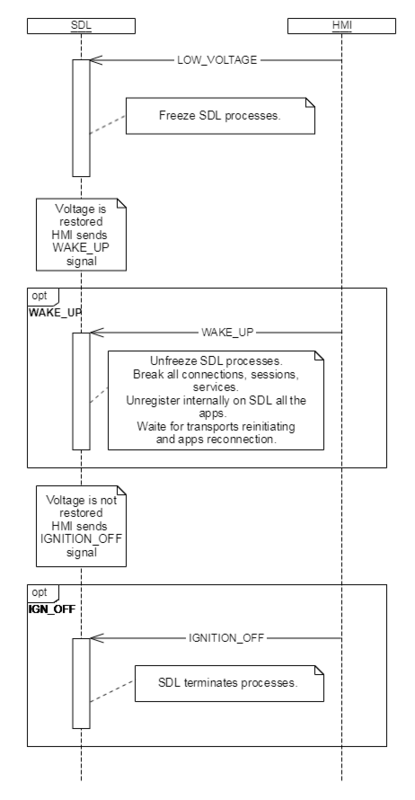 SDL ignores all responses and messages from HMI except for WAKE_UP or IGNITION_OFF signals. SDL stops audio/video streaming services. All transports are unavailable for SDL. SDL persists resumption related data stored before receiving a LOW_VOLTAGE signal. SDL and the PoliciesManager must persist 'consumer data' (resumption-related + local PT). After the voltage level is restored HMI sends WAKE_UP signal to SDL and SDL processes its regular work and all operations resumption. After receiving a WAKE_UP signal, all applications will be unregistered and the device disconnected. If LOW_VOLTAGE was received at the moment of writing to policies database, SDL and Policies Manager must keep policies database correct and working. After WAKE_UP policy database reflects the last known correct state. SDL must be able to start up correctly in the next ignition cycle after it was powered off in low voltage state. UNIX signals are used to exchange shutdown and wake-up signals between HMI and SDL Core during a 'LowVoltage' event. UNIX signals provide ability to use signals from SIGRTMIN to SIGRTMAX for custom needs. SDL uses this range for handling LOW_VOLTAGE, WAKE_UP, IGNITION_OFF notifications.